Nine day notice. I’ll be book signing at Barnes & Noble in Fresno on Sunday, August 13 at noon. 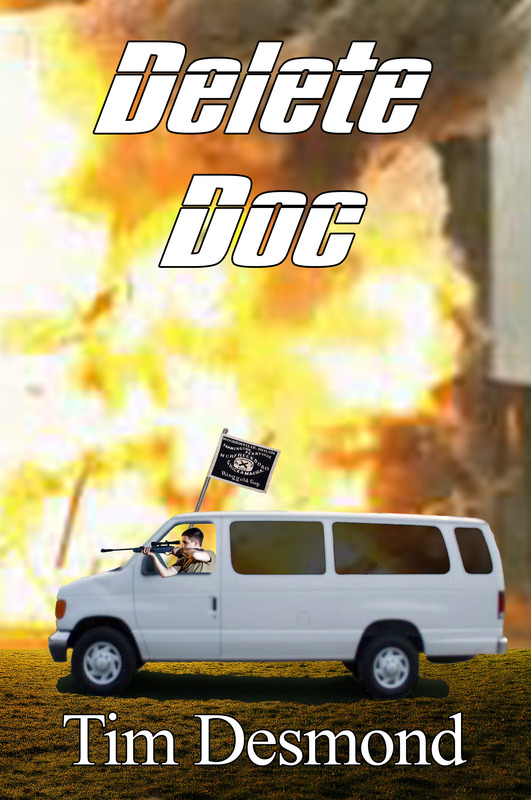 Mainly for “Pappy Butler & His Zero Time Theory,” but I understand that copies of “The Doc” will be there too. This is either a midway event of the 2017 summer book tour or – as said last week – an early start for the fall tour. I may talk a bit about the books, as they are setting up some chairs in the music/CD area. It is only …. NINE days away from the SIGNING at BARNES & NOBLE – FRESNO, on Blackstone and Nees, by the B of A and Elephant bar..
AGAIN – THAT IS SUNDAY – AUGUST 13 – AT NOON. I came across this blog article and just had to give it a boost and share it with you here as well as on Facebook and Twitter. By DM O’Byrne ……….. it is here: ……. This is either a midway event of the 2017 summer book tour or an early start for the fall tour. It is only …. one week away from the BOOK TALK AND SIGNING at Woodward Park Branch of Fresno County Library. 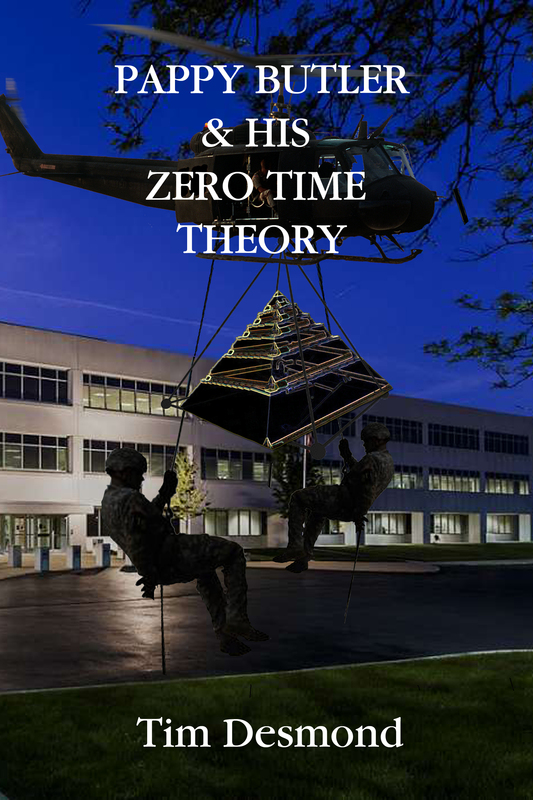 While the flyer has only THE DOC book cover, [[ as the sequel to that book is due out this October ]], I will have the Pappy Butler & his Zero Time Theory book there as well. I will be talking about it all. So Mark your calendars for Wednesday July 26 – 7:00 PM. Flyer from Fresno County library below ……. 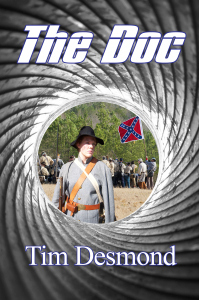 When a dying friend and fellow Civil War reenactor asks physician Hank Houston to find his daughter’s killer, the last thing he expected to uncover was a U.S. murder squad being run by Homeland Security, and this black ops unit is determined not to be exposed! As Hank gets closer to the truth, he discovers just how far they will go to hide all their dirty little secrets. 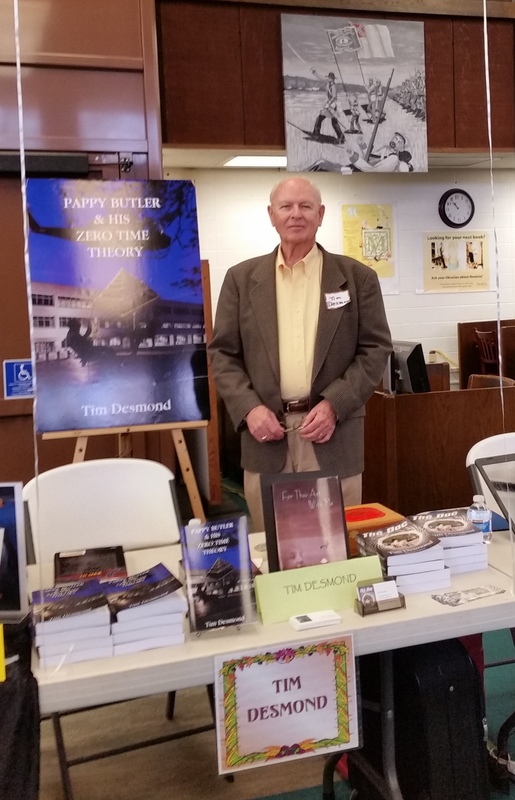 Local author Tim Desmond discusses this book and his newest book Pappy Butler & His Zero Time Theory! Now that the court case has been settled, prints are available of this painting. The poster is on 24 pound paper and is 24 x 25 inches. It seems a long time since the painting was finished two years ago first shown at the Sorenson Studios & Gallery’s 2015 Black & White show. 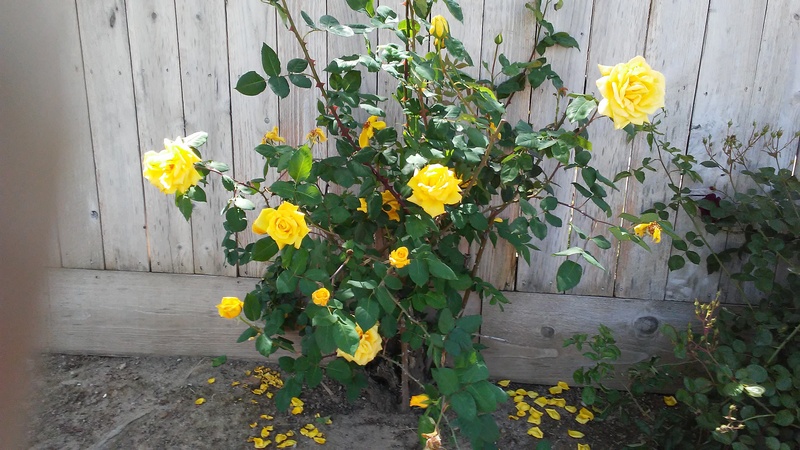 It was shown there for all of May 2015. For the October 2015 Big Fresno Fair Art exhibit, it was not allowed. That prompted advice from a friend to contact CIR – Center for Individual Rights. Yesterday, May 2, the settlement and stipulation was finalized with the attorneys at California Department of Justice. Below is the KCRE 3 Sacramento Facebook posting based on the AP release about the case. AP had requested a photo of the painting from me for their release. There may be another piece released about this. 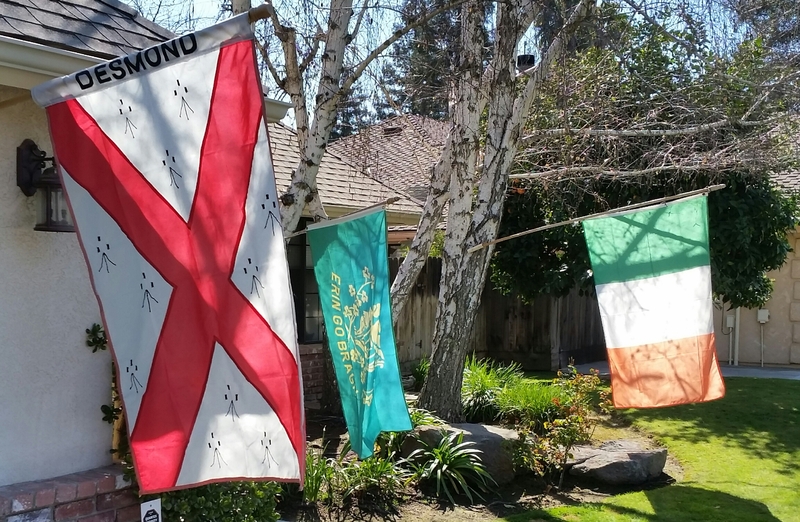 Here is that May 2 posting below …..
California’s ban on displaying the Confederate flag doesn’t apply to individuals even if they are on government property, state officials said this week in settling a free speech lawsuit. Fresno artist Timothy Desmond sued after his painting depicting the flag was barred from the 2015 Big Fresno Fair. 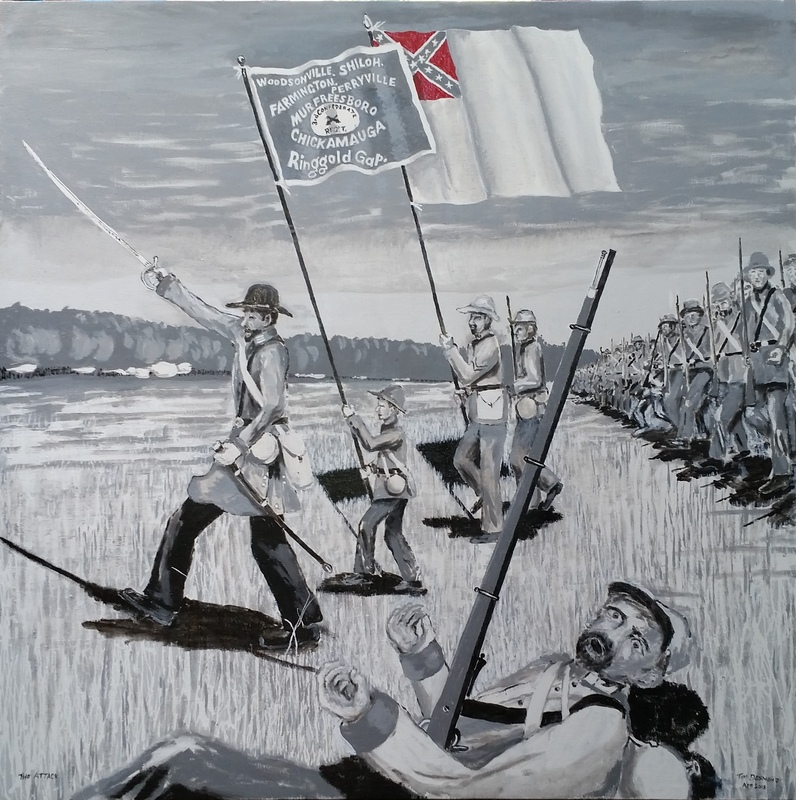 His painting shows Confederate soldiers fighting in the 1864 siege of Atlanta, led by a soldier carrying the battle flag. California’s 2014 law says the state cannot display or sell the Battle Flag of the Confederacy or any similar image unless it appears in a way that serves an educational or historical purpose. Fair officials used that law to ban Desmond’s painting a year later, but they let him display the painting during the 2016 fair. The settlement signed by the state attorney general’s office on Monday says that the ban applies only to the state government and not to private individuals. Individuals are still free to carry, display or sell the flag on private or government property. The nonprofit Washington, D.C.-based center represented Desmond in the lawsuit. California Attorney General Xavier Becerra’s office referred requests for comment to the state Department of Food and Agriculture, where the media office was not accepting messages after business hours. Desmond himself wasn’t commenting on the lawsuit or the settlement, a spokeswoman for the center said. The center’s website describes him as a retired high school science teacher who regularly entered his paintings in local art fairs.